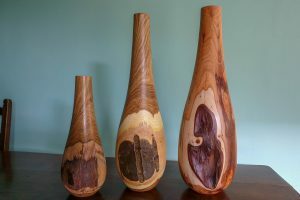 Just finished these three beauties today – two are Laburnum and the other is Yew. The Yew has been down the bottom of my garden for some years, so it was about time I did something with it. 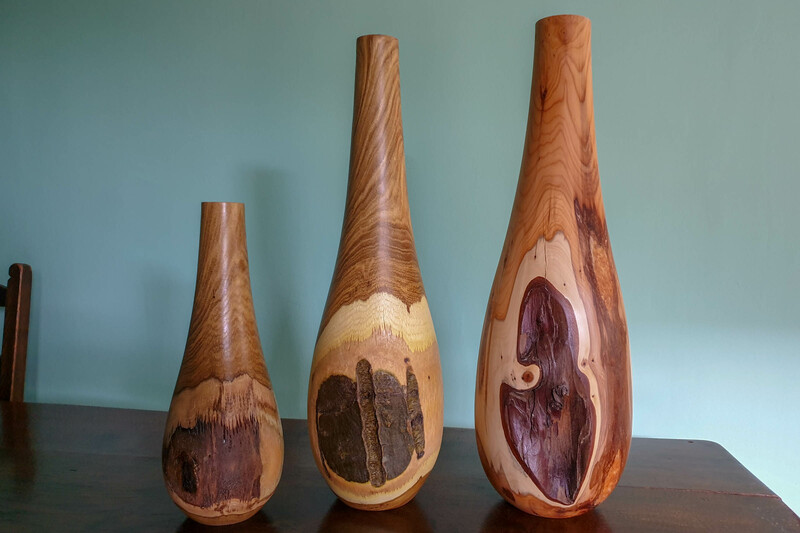 the Laburnum, however, only came down in a storm a few months ago, so these were rough turned and hollowed whilst green to speed up the drying process. 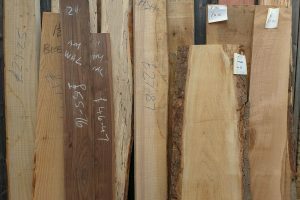 Both of these timbers are a pleasure to work with, and few other timbers can match the spectacular colour difference between the pale sapwood and the darker heartwood. The shape of these vases was chosen to show off this characteristic to the maximum effect and I think it worked! There are a few small cracks in each, but that is the nature of wood. Had I left them to season naturally, then I may have reduced the cracking but that’s not guaranteed – nothing is with wood! The yew, after all, had been seasoning naturally for 10 years or more and also has a good number of cracks.